Whilst sitting at my desk, taking a tropical daydream, I decided to explore this beautiful fruit. Pitayas, also know as Dragon fruit is of the cacti family and are originally native to Mexico. They were transplanted to Central America and to other parts of the world and are now cultivated in East Asia, South Asia and Southeast Asian countries. 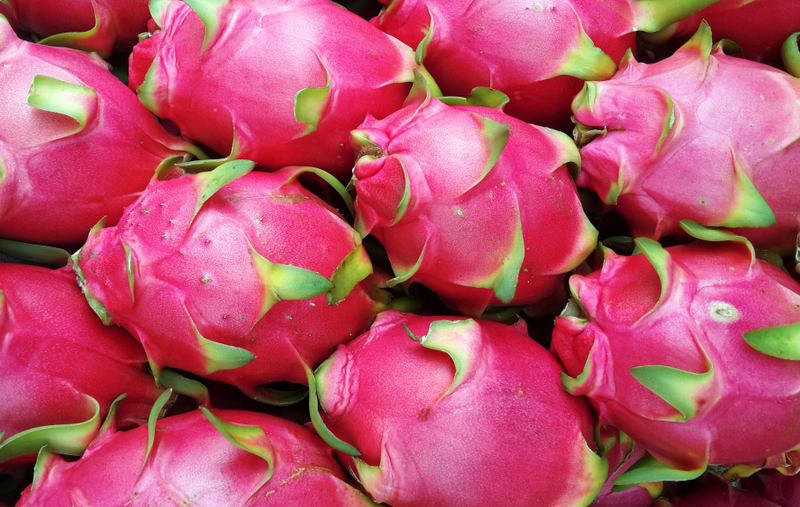 Dragon fruit is used in fruit salads however also works fabulously in savoury salads and pairs well with seafood too! This particular fruits texture is likened to that of a kiwi fruit because of it’s black crunchy seeds. The flesh, which is eaten raw, is mildly sweet and low in calories!!! These plants can handle temperatures up to 40 °C and very short periods of frost, but will not survive long exposure to freezing temperatures. Pretty incredible! Cacti fruit – who would have thought?